Are you aware of your responsibilities within fire safety for your company? Are you aware of your responsibilities within fire safety for your company? If you are the owner or occupier of a non-domestic building you have legal obligations to uphold to protect your staff, visitors, its contents and the building itself. These legal obligations across the UK require the appointed responsible person (duty holder in Scotland) for non-domestic premises to have adequate fire protection. It is their responsibility to ensure there is a sufficient, up to date fire risk assessment and that all requirements addressed in this are carried out competently. This responsible person if not appointed becomes the employer/the person who controls the premises by default in the Regulatory Reform (Fire Safety) Order 2005 (RRO 2005). If you are unsure on who controls your premises this needs to be addressed to ensure you are not under any risk from fire and to establish who holds responsibility. As listed in Article 9, ‘The responsible person must make a suitable and sufficient assessment of the risks to which relevant persons are exposed for the purpose of identifying the general fire precautions he needs to take to comply with the requirements and prohibitions imposed on him by or under this Order.’ This fire risk assessment will recognise precautions already in place and also actions needed. These findings must be recorded and kept (if you employ 5 or more people) and must be regularly reviewed. This must also be revisited if the building/rooms change use to ensure provisions in place for fire safety are still appropriate. Within current legislation, anybody can provide a fire risk assessment and you are permitted to provide your own company assessment if you feel confident you can fulfil this. However, you can only identify risks you are aware of and how can you be sure you have provided an appropriate assessment according to the law? If the assessment is thought to have been carried out to an insufficient extent, the responsible person can face an unlimited fine or up to two years in prison. 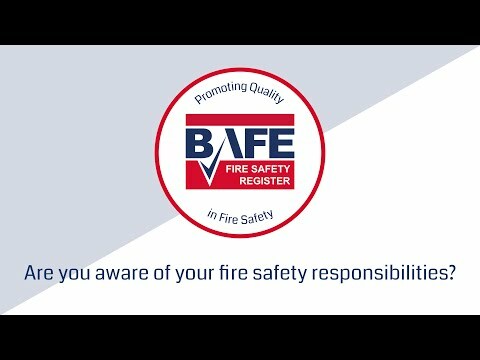 To make sure you have completed your fire risk assessment, which is a vital part of meeting your obligations and to highlight actions needed to create a safe work environment, you can use a BAFE Life Safety Fire Risk Assessment (SP205) certified and approved company. For other requirements listed in legislation you can use BAFE approved companies also. In Article 13 the RRO 2005 states that ‘the premises are, to the extent that it is appropriate, equipped with appropriate fire-fighting equipment and with fire detectors and alarms.' BAFE runs schemes to become certified in these areas and by using these companies you can be sure you have appropriately put in place correct provisions to protect yourself and others from fire. If you are looking for the supply and maintenance of portable extinguishers, search for a company registered to the BAFE Competency of Portable Fire Extinguisher Organisations and Technicians (SP101) scheme. All of these registered companies are Third Party Certificated for this service and their fire extinguisher technicians are assessed by BAFE for ongoing competence. For your fire detectors and alarm system, companies should hold BAFE Fire Detection and Alarm Systems (SP203-1) scheme approval. This scheme includes the design, installation, commissioning and maintenance of fire detection systems and also requires that all equipment used is third party certificated. Registration to this BAFE scheme is often a key requirement criteria in tenders for the provision of fire alarms. BAFE developed a scheme regarding emergency lighting to ensure these systems are correctly worked on by competent companies. If you are looking for a company to work on your emergency lighting system look for one registered to the BAFE Emergency Lighting Systems (SP203-4) scheme. Just as important as getting these systems for your fire safety policy in place is to ensure they ‘are subject to a suitable system of maintenance and are maintained in an efficient state, in efficient working order and in good repair’ (Article 17). Implemented fire protection systems are not switched on and off every day like security detection, but you have to be confident it will work at any time, immediately and that it meets the needs of your premises. All of the BAFE schemes will cover maintenance from fire extinguishers to emergency lighting, fire detection/alarms and fixed gaseous fire suppression systems. Maintenance of these systems should also be addressed in your fire risk assessment as this is an ongoing document that should be reviewed regularly. By using BAFE registered companies you can be assured you are using third party certified, competent people for the task required. Search here to find third party certificated competent companies near you - Always specify what areas of fire protection you require and verify that they are certified in those areas.